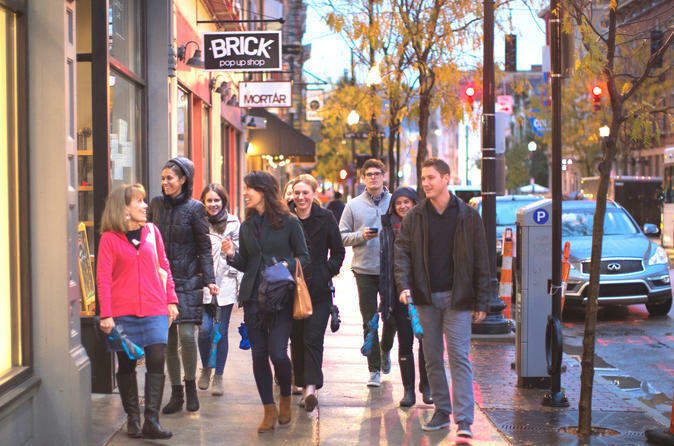 Join us for an evening stroll as we taste and sip the night away in the German historic area called Over the Rhine, just a few blocks north of downtown Cincinnati. This hip and vibrant 360 acre neighborhood has been totally transformed from an urban ghetto to the largest collection of mid century Italianate buildings in the country! We begin our "walk through history" in a scenic 8 acre Victorian park. We dine at 4 unique restaurants featuring chef inspired dishes. Plus, we get the VIP tour, as we have private access to the cellar of an urban winery. When visiting Cincinnati, this is the one neighborhood you don't want to miss. This adult only, evening tour is fun, relaxing and fills you up both body and soul. We promise you won't be bored and you won't leave hungry! Walk through pages in a history book as we stroll through Over the Rhine, just a few blocks north of downtown Cincinnati. We begin in beautiful Washington Park dating back to the Victorian era, complete with a bandstand, fountains, statues and majestic trees. It is an 8 acre city oasis. Learn about majestic Music Hall and why it is said to be haunted! Dine in beautiful restored Italianate buildings which were former tenements and corner convenience stores. Did you know you can enjoy East Coast seafood in Cincinnati? Or how does an Artisan flatbread baked in an Old World oven sound? Our second tasting may take place in an 18th century German Beer hall, now turned into a snout to tail butchery. You can't get a panini any fresher than that! Or we may just dine in a German restaurant with a roof top view! The best is yet to come, as we approach our third stop, a brand new urban winery. You will not meet a friendlier staff who love to share their story by engaging you in their wine making process. This boutique winery specialize in handcrafted small batch wines using a process that originated in Italy by the owners family! Have you been to Argentina? Our third restaurant is owned by two Argentinians who create the best empanadas in the city using their grandmothers recipes. We end the tour on a sweet note where your dessert is created right before our eyes! With a couple shots of liquid nitrogen, fresh cream, sugar and alcohol you have a buzzed ice cream treat! Or how long has been since you tasted a S'more? We know a special place that specializes in homemade marshmallows topped with Flamin’ Hot Cheetos, Oreos or Ruffles potato chips. Our food tours are more than just food. You get an insider's view of this fascinating neighborhood and travel back in time to the glory days of this German city within a city. Our tours encompass the sights, the history, the culture, the architecture, the best restaurants and all the information you need to return again and again. We share history not only through expert story telling, but visually with old photographs. This tour includes on glass of wine. Additional drinks are available for purchase. We can accommodate vegetarians only. Vegetarians must call Laura at 513-289-0035 24 hours prior to the tour. We cannot accommodate food allergies, locarb diets, vegan, gluten free or any other diet restrictions. This is a 3 hour walking tour at a leisurely rate. The return walk to the starting point is .5 miles.